Figure 1. (a) Examples of three peg matrices, (b) Sighted child and congenitally blind child performing spatial task, and (c) Sample sequences on a 4 × 4 grid. Imagine a square box about the size of a soccer ball. Now imagine turning it over with your hands. It’s a task that’s easy for most people to do — indeed, we use spatial imagery all the time to handle objects, plan movements, and navigate through various environments. Different sensory modalities, including vision, audition, and touch, provide information about our environment. So how can we figure out the relative importance of each modality in contributing to spatial imagery? “One promising way forward is to study those rare cases in which people have not received treatment for disorders that cause profound sensory loss in a particular modality, even though their conditions are curable,” notes researcher Tapan K. Gandhi of MIT and colleagues. Taking this approach, Gandhi and colleagues examined spatial imagery skills in three groups of subjects: children that had been blind from an early age, children who were normally sighted, and children who had been blind from birth as a result of dense cataracts in both eyes. Importantly, these cataracts were treatable. The children were given square peg boards of varying dimensions and were allowed to explore the boards with their hands to become familiar with their arrangement (the normally sighted children wore a blindfold throughout the task). The boards were then taken away and an experimenter described a sequence of moves starting from the peg in the bottom left-hand corner. The children got the boards back and they had to point to the ending peg based on the moves given by the experimenter. As the researchers expected, normally sighted children who wore blindfolds outperformed the children who were blind from an early age. The findings showed that the blind children performed well when the peg board dimensions were small and when the number of moves was small. 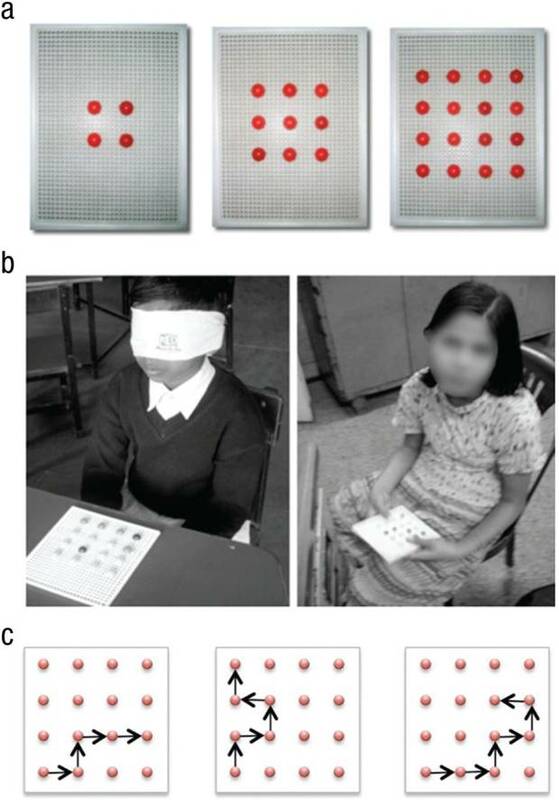 As the task became more complex — with increasing board size and/or number of moves — their performance decreased significantly in comparison to children with normal sight. The same was true of children with cataracts. But, their performance noticeably improved after their cataracts were treated and sight was restored. “Taken together, these results suggest that visual experience can significantly enhance spatial imagery capabilities,” Gandhi and colleagues conclude.